A loan of $2,000 helped to change the decoration of her studio and buy lights for her studio. Nagham is a 24-year-old single Palestinian refugee living in Lebanon. Nagham lives with her family but she is an independent lady who tries her best to improve her living conditions. 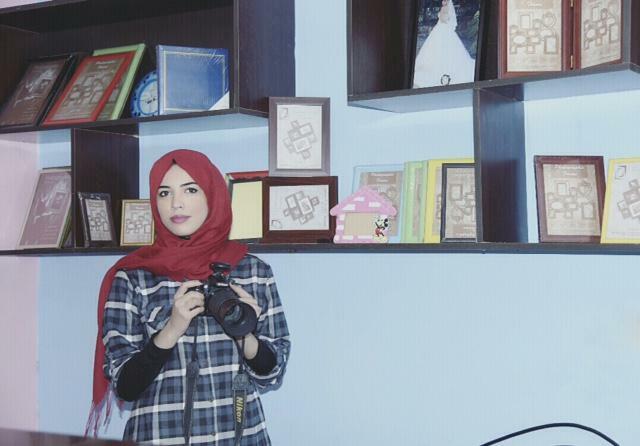 Nagham started running her own photography studio in 2015. She has learned this type of work from her uncle. When he traveled, he left his equipment and cameras for her. She is so passionate about photography. She is acquiring this loan from Kiva's field partner, Al Majmoua, to buy lights and change the decoration of her studio. Nagham hopes that she will be able to invest more in her business and expand it to improve her living conditions. It benefits refugees who have been marginalized. This loan helps Palestinian refugees living in Lebanon, specifically in refugee camps throughout the country. Palestinian refugee camps in Lebanon often have poor infrastructure and do not receive the same basic services as the rest of the country. Palestinian refugees have been marginalized by the Lebanese government and society, as they face many restrictions and discrimination in the work, educational, and health fields. By funding this loan, you are helping these marginalized individuals develop their businesses and provide for their families. The Lebanese Association for Development – Al Majmoua is Lebanon’s leading microfinance institution and the oldest Kiva partner in Lebanon. Al Majmoua’s vision is to “be the leader in creating an inclusive financial system where all people in Lebanon have access to affordable services.” Given Lebanon's diverse population, Al Majmoua lends to all nationalities, provided legal residency. The strong financial position achieved to date has allowed Al Majmoua to steadily lower its pricing over the years. Based on the belief that non-financial services play a complementary role in improving the quality of life of the most vulnerable entrepreneurs, Al Majmoua has established a solid Business Development Services program for both borrowers and non-borrowers with a focus on women and youth. Al Majmoua, one of the leaders in the microfinance market in Lebanon, is a non-governmental organization (NGO) with a strong social focus that permeates all levels of the organization. Kiva's partnership with Al Majmoua enables expansion and growth in this challenging market, and the profits from Kiva loans are re-invested in the organization. Kiva funding is specifically being used by Al Majmoua to offer innovative loan products and reach some of the most challenging and marginalized populations in Lebanon. This includes lending in the Palestinian refugee camps, working with Syrian refugees, and providing financial services to individuals with physical disabilities.